Turn your party into a true fiesta by picking up some Cinco de Mayo decorations. Cinco de Mayo began as a holiday celebrating a war victory for Mexico, but today, May 5 has become a day for celebrating Mexican heritage and culture across Mexico and the United States. A fiesta, or party, with family and friends is how most people celebrate Cinco de Mayo. The decorations create a merry atmosphere and highlight aspects of the Mexican culture. Because the Mexican flag is red, white and green, many decorations include these colors. Other vibrant hues, like yellow, orange and bright purple, are often included in decorations, too. To turn your home into a Mexican landscape, consider purchasing a scene setter. These are large, wide banners, often big enough to cover the length of a wall, halfway to the ceiling. The setting could be a desert scene, complete with cacti and rocks or a fiesta in the streets of a Mexican pueblo, or village. In one part of the party area, you could even represent a Mexican beach. Place a large sun on the wall and fill a miniature sandbox with sand, complete with beach toys to keep kids busy. Just remember to cover the floor area with plastic before setting up. Light up your Cinco de Mayo festivities with some creative ideas. Find chili pepper garlands to string around the room or outdoor party patio. Swap light bulbs for red, white and green bulbs. Hang paper lanterns in colorful shades on trees at an outdoor party. Another wonderful way to light up the party area is to place small tea lights in Mexican pottery. Kids and adults can work together to create their own homemade Cinco de Mayo decorations. Homemade decorations add a personal touch to the celebration. They are also often much cheaper to make than purchasing decorations, plus provide a fun Cinco de Mayo activity before the party begins. Try making paper lanterns, piñatas and cascarones together for the party. Making paper lanterns does not require much more than paper, cardboard, ribbon and a small, battery-operated light. Decorate your lantern using red, white and green stripes for the Cinco de Mayo party. Find complete instructions in the article How to Make Paper Lanterns. Cover a large blown-up balloon with paper mache, leaving a small area open. After the mache has dried, pop the balloon and remove it. 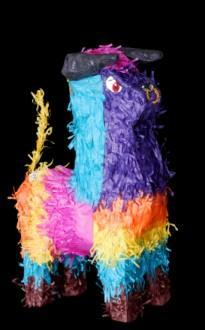 Paint the paper mache piñata or add ribbons, tissue paper and decorations to make it festive for Cinco de Mayo. Fill the piñata with candies and small toys through the opening. Make two small holes next to the larger one and loop a thin rope through the top in order to hang it at the party. A cascarone is a confetti-filled egg. They are decorated in bright colors and can be placed throughout your party or as part of a table centerpiece. Although they are not always traditionally used in Cinco de Mayo festivals, they are part of Mexican culture and are a good addition for any fun party. Find instructions for making cascarones at ZOOM. Commemorate a special day in Mexican history with appropriate Cinco de Mayo decorations. Whether you purchase them or make them yourself, they are sure to put everyone in a party mood. Top your party off with some great food and music to truly immerse yourself in Mexican culture.